After a bit of a hiatus, test lab Thursday is back! 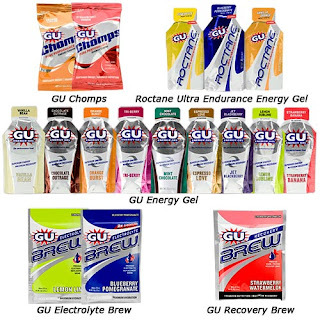 This time I’ll be reviewing a sample pack of GU products. Nice folks from outside PR sent me the Gu sampler pack awhile back. Through my HIM training and through Mr. Pi’s Ultra training we used almost all of the products in the pack. I’ve been running longer races since 2007 when I ran my first half marathon. My first experience with energy gels was not pleasant, I didn’t like them at all! However, over time I have come to like and even enjoy certain flavors—they are like a mid-run treat. This is why I say the rating is a mixed bag. *This is Mr. Pi’s favorite. Overall, that’s actually not bad, 4 out of 9 I like a lot, 3 out of 9 I can tolerate and I only despise 2. I let Mr. Pi try out the Roctane’s and he liked the pineapple and vanilla orange but said he wasn’t a fan of the blueberry-pomegrante. I actually really liked both of these the flavor was really subtle. I used them both during pretty long training rides in the heat and didn’t feel like they made me more thirsty. Sometimes with electrolyte drinks I get more thirsty. These also didn’t bother my stomach. I enjoyed both the orange and strawberry but they didn’t really fill me up. Usually chewy energy stuff fills me up but these left me hungry. I have yet to try this product so I can’t comment quite yet but wanted to get this review in the books. At some point there will be a part II to this review and I’ll try out the Strawberry Watermelon recovery brew. 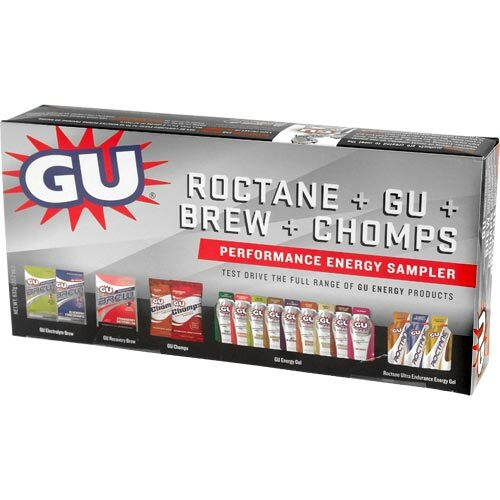 This sampler pack would be a great gift for anyone training for their first marathon or runners who are getting into the longer distances and needing nutrition. It’s a great way to try a lot of different products for a little cost. The lowest cost of the sample pack that I found online was $23.99 (http://www.guenergy.com/products/performance-energy-sampler). Thanks to Outside PR for letting me try out the sample pack! Stayed tuned for a giveaway in the next few weeks.